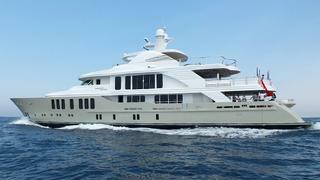 CMB Yachts has completed sea-trials of their 47m superyacht Orient Star, and delivered her to her owner. RINA classed and built in composite to an in-house design, Orient Star is a slightly larger sister of the 46 metre Mystic launched by the same yard in 2010. Her interior, designed by British designer Tara Bernerd of Tara Bernerd & Partners, accommodates up to 12 guests in five cabins, including a full-beam master suite on the main deck, plus two doubles and two twins with a Pullman berth. The crew quarters house a crew of eight. Powered by twin 1,450hp MTU engines, she will achieve a top speed of 17 knots, a cruising speed of 13 knots and a range of 4000 nautical miles at a more economical speed.